James Butler Hickok was born in Troy Grove, Illinois, in 1837. His father, Bill Hickok, played an active role in the Underground Railroad that helped slaves escape from the Deep South. Hickok moved to Kansas in 1855 and at the age of 20 was elected constable of Monticello. In 1861 he was working as a wagon master in Montana. On 12th July, 1861, Hickok opened fire on three unarmed men. David McCanles was killed and James Woods and James Gordon were seriously wounded and later died of their injuries. Hickok was also employed as a guide on the Santa Fe Trail. Later he worked on the Oregon Trail. During the American Civil War Hickok was employed as a scout for the Union Army. After the war came to an end Hickok became a professional gambler in Springfield, Missouri. Also, for a brief time he served under General George A. Custer in his 7th Cavalry. Hickok returned to his life as a gambler and in 1866 gave an interview to a journalist, George Ward Nichols about his exploits as a gunfighter. The article appeared in the February, 1867, edition of Harper's New Monthly Magazine. Newspapers such as the Leavenworth Daily Conservative, Kansas Daily Commonwealth, Springfield Patriot and the Atchison Daily Champion quickly pointed out that the article was full of inaccuracies and that Hickok was lying when he claimed he had killed "hundreds of men". In 1868 Hickok became sheriff of Hays City in Kansas. It was a rough city and Hickok was determined to use violence to keep the men under control. In August, 1869, Hickok killed Bill Mulvey in a gunfight. The following month he shot Samuel Strawhun dead after he caused trouble in a saloon. The people of Hays City became concerned by Hickok's behaviour and he was replaced by his deputy, Peter Lanihan. In April 1871, Hickok was employed as marshal of Abilene. He was paid $150 a month plus a percentage of the fines. Hickok also received 50 cents for every unlicensed dog he shot. Hickok did not take his duties seriously and spent most of his time playing poker. In October 1871 he shot and killed two men, Phil Coe and a fellow officer, Mike Williams. This incident upset the city council and two months later Hickok lost his job. Hickok now toured with Buffalo Bill Cody and his Wild West Show (1872-73) before teaming up with Calamity Jane in Deadwood, Dakota. He also married Agnes Lake and for a time tried gold mining. Hickok also spent a lot of time with John Wesley Hardin. On 2nd August, 1876, Wild Bill Hickok was playing cards in Deadwood. Jack McCall, seeking revenge for the death of his brother, shot Hickok in the back of the head. At the time of his death, Hickok was holding a pair of black aces and a pair of eights, and this became known as "A Dead Man's Hand". Three wagon loads of arms and ammunition passed through the neighborhood below here last week, going westward. On Friday three men were killed at Rock Creek on the Military Road about 30 or 35 miles west of this. All we know is that the difficulty originated in the distribution or division of a wagon load of stuff from the Missouri river, and it is supposed it was one of the three wagons mentioned above. During the difficulty some secessionists put a rope around a Union Man's neck, and dragged him some distance toward a tree with the avowed purpose of hanging him. He (Hickok) managed to escape. They then gave him notice to leave in a certain time or be hung. At the end of the time five of them went to his house to see if he had gone, when he commenced firing upon them and killed three out of the five; the other two making a hasty retreat. The McCandlas gang consisted of only the leader and three others, and not of fourteen as stated in the magazine. Of these "Wild Bill," in the fight referred to, shot McKandlas through the heart with a rifle, and then stepping out of doors, revolver in hand, shot another of the gang dead; severely wounded a third, who ran off to a ravine near by, and was found there dead, and slightly wounded the fourth, who ran away and was not heard of afterwards. There was no grudge existing between the McKandles gang and "Wild Bill," but the former had a quarrel with the Stage Company, and had come to burn the station "Bill" was in charge of. Springfield is excited. It has been so ever since the mail of the 25th brought Harper's Monthly to its numerous subscribers here. The excitement, curiously enough, manifests itself in very opposite effects upon our citizens. Some are excessively indignant, but the great majority are in convulsions of laughter, which seem interminable as yet. The cause of both abnormal moods, in our usually placid and quiet city, is the first article in Harper for February, which all agree, if published at all, should have had its place in the "Editor's Drawer," with the other fabricated more or less funnyisms; and not where it is, in the leading "illustrated" place. But, upon reflection, as Harper has given the same prominence to "Heroic Deeds of Heroic Men," by Rev. J. T. Headley, which, generally, are of about the same character as its article "Wild Bill," we will not question the good taste of its "make up." 'Wild Bill' is, as stated in the Magazine, a splendid specimen of physical manhood, and is a dead shot with a pistol. He is a very quiet man, rarely talking to any one, and not of a quarrelsome disposition, although reckless and desperate when once involved in a fight. There are a number of citizens of this city who know him well. Nichols' sketch of 'Wild Bill' is a very readable paper, but the fine descriptive powers of the writer have been drawn upon as largely as facts, in producing it. There are dozens of men on the Overland Line who are probably more desperate characters than Hickok, and are the heroes of quite as many and as desperate adventures. The wild West is fertile in 'Wild Bills.' Charley Slade, formerly one of the division Superintendents on the O. S. Line, was probably a more desperate, as well as a cooler man than the hero of Harper's, and his fight at his own ranch was a much more terrible encounter than that of 'Wild Bill' with the McKandles gang. A man named Sam Stranghan was shot and instantly killed by "Wild Bill" (J B. Hickok) Sheriff, at one o'clock this morning. It appears that Stranghan and a number of his companions being "wolfing" all night, wished to conclude by cleaning out a beer saloon and breaking things generally. "Wild Bill" was called upon to quiet them. In the melee that followed Stranghan was killed. The Coroner s verdict this morning was justifiable homicide. Stranghan was buried this afternoon. About twelve o'clock last night a difficulty occurred in this place at the house of John Bittles, between a party of roughs and the proprietor. 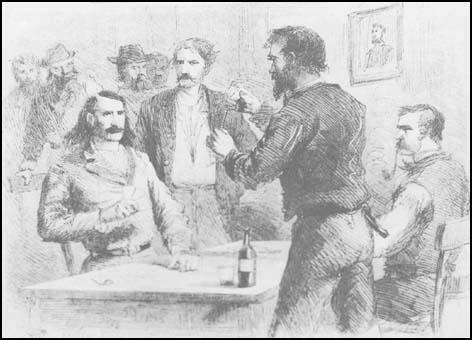 Policemen Hickok and Lanihan, interfered to keep order, when remarks were made against Hickok - Wild Bill. In his efforts to preserve order, Samuel Stringham was shot through the head by him, and instantly killed. Justice Joyce held an inquest on the body today, six well-known citizens being selected for the jurymen. The evidence in one or two instances was very contradictory. The jury returned a verdict to the effect that Samuel Stringham came to his death from a pistol wound at the hands of J. B. Hickok, and that the shooting of said Stringham was justifiable. Two soldiers of the Seventh cavalry were shot at Hays City last Tuesday night by Wild Bill. The names of the men were Langan and Kelly. The greatest excitement prevails in the town owing to the outrage. After the shooting was over Wild Bill made for the prairie and has not been heard of since. The citizens were out en masse looking for Bill, so that he might be summarily dealt with. The parties were all under the influence of liquor at the time. Before I got to Abilene, I had heard much talk of Wild Bill, who was then marshal of Abilene. He had a reputation as a killer. I knew Ben Thompson and Phil Coe were there and had met both these men in Texas. Besides these, I learned that there were many other Texans there, and so, although there was a reward offered for me, I concluded to stay some time. Jim Clements took the train and went back to Texas. Phil Coe and Ben Thompson at that time were running the Bull's Head saloon and gambling hall. They had a big bull painted outside the saloon as a sign, and the city council objected to this for some special reason. Wild Bill, the marshal, notified Ben Thompson and Phil Coe to take the sign down or change it somewhat. Phil Coe thought the ordinance all right, but it made Thompson mad. Wild Bill, however, sent up some painters and materially changed the offending bovine. For a long time everybody expected trouble between Thompson and Wild Bill, and I soon found out that they were deadly enemies. Thompson tried to prejudice me every way he could against Bill, and told me how Bill, being a Yankee, always picked out Southern men to kill, and especially Texans. I told him, "I am not doing anybody's fighting just now except my own, but I know how to stick to a friend. If Bill needs killing, why don't you kill him yourself?" He said, "I would rather get someone else to do it." I told him then that he had struck the wrong man. 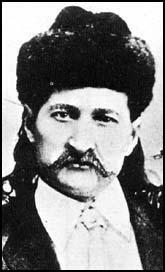 I had not yet met Bill Hickok, but really wished for a chance to have a set-to with him just to try his luck. Wild Bill, facing the desperate character who entered the front door, had shot him with a revolver in his left hand, while with his right hand he had thrown the other gun back over his left shoulder and shot the man coming from the rear. History does not record a more dare-devil act, a more astute piece of gun-work, or a cleaner fight. Wild Bill, as a frontier character of the daring, cunning and honorable class, stands alone, without a prototype; his originality is as conspicuous as his remarkable escapades... Wild Bill was a necessary character in the Far West during the period which marked his career. He was essentially a civilizer, in the sense of a vigilance posse... When Bill drew his pistol there was always one less desperado to harass the law-abiding, and his presence served to allay the hunger of cut-throats and rapacious plunderers. Any plan who by his own force and fearlessness beats the dark forces of savagery and crime, so that civilization may be free to take another step forward on her march to progress - is he not the greatest and truest type of the frontiersman? Such a man was Wild Bill. He typified the pioneer, enduring danger and hardship that in his wake might follow peaceful farmers and merchants; that where he had passed might spring up villages and towns. It is disgusting to see the eastern papers crowding in everything they can get hold of about "Wild Bill." If they only knew the real character of the men they so want to worship, we doubt if their names would ever appear again. "Wild Bill," or Bill Hickok, is nothing more than a drunken, reckless, murderous coward, who is treated with contempt by true border men, and who should have been hung years ago for the murder of innocent men. The shooting of the "old teamster" in the back, for small provocation, while crossing the plains in 1859, is one fact that Harper's correspondent failed to mention, and being booted out of a Leavenworth saloon by a boy bar tender is another; and we might name many other similar examples of his bravery. In one or two instances he did the U.S. government good service, but his shameful and cowardly conduct more than overbalances the good. so plentiful and tame). Wild Bill was a fine-looking fellow, with long curly hair hanging down his back, and was dressed in a rather dandified fashion. He was said to have twenty-seven nicks cut on the handle of his revolver, each signifying a man whose life had been taken by him. And yet he walked the streets as free as any man, and perhaps with more security than a less desperate criminal would, for he would have to be a plucky man to arrest "Wild Bill." He was afterwards actually elected "sheriff" of Wichita, a town down south, which was frequented by the Texas "cowboys," and he was killed at last in some saloon brawl. We learn from recent dispatches that Mr. J. B. Hickok, (Wild Bill), well known to the older citizens of Hays City, was shot in the head and instantly killed, by a man named Bill Sutherland, while playing cards in a saloon in Deadwood Gulch, Wyoming. From the report it seems that Bill had killed a brother of Sutherland's in this city, several years ago, and in revenge the latter shot Bill, taking him unawares. This is the long-looked for ending of the career of one who deserved a better fate. For nearly his whole life time Bill was on the frontier, a portion of the time acting as scout, and then as an officer of the law in some frontier town. He was elected Sheriff of this county in 1868, and did good service in keeping order. While here he killed several men; but all their acquaintances agreed that he was justified in so doing. He never provoked a quarrel, and was a generous, gentlemanly fellow. In person he was over six feet tall, broad-shouldered, and a specimen of perfect manhood throughout. He was a dead shot, wonderfully quick in drawing and shooting, the latter faculty filling his enemies with a very wholesome respect, when in his presence. Living as he did in constant fear of his life, he always kept his revolvers with him, and had the fellow that shot him given him a fair fight, and not taken the cowardly advantage that he did. Wild Bill would not have been killed. My friend, Wild Bill Hickok, remained in Deadwood during the summer with the exception of occasional visits to the camps. On the 2nd of August, while setting at a gambling table in the Bell Union saloon, in Deadwood, he was shot in the back of the head by the notorious Jack McCall, a desperado. I was in Deadwood at the time and on hearing of the killing made my way at once to the scene of the shooting and found that my friend had been killed by McCall. I at once started to look for the assassian and found him at Shurdy's butcher shop and grabbed a meat cleaver and made him throw up his hands; through the excitement on hearing of Bill's death, having left my weapons on the post of my bed. He was then taken to a log cabin and locked up, well secured as every one thought, but he got away and was afterwards caught at Fagan's ranch on Horse Creek, on the old Cheyenne road and was then taken to Yankton, Dak., where he was tried, sentenced and hung. During his residence in Hays, Hickok was one of the best citizens of the town... All concede that he was a kindhearted, gentle mannered gentleman, and only when aroused was he dangerous. Many of his old friends now reside in Hays, and all express great sorrow at his untimely end.